How to take: For oral use. Dissolve the contents of one sachet into a mug of hot, but not boiling, water. Allow to cool to a drinkable temperature. Adults, the elderly and children 12 years and over: The contents of one sachet to be taken every four hours as required. Do not take more than 4 sachets (4 doses) in any 24 hour period. Do not give to children under 12 years old. Do not take with any other flu, cold or decongestant products or with alcohol. Consult your doctor Before taking this medicine, if you are under the care of your doctor or are taking medication, or are pregnant, or have diabetes, blood vessel disease or angina. If you suffer from kidney or liver disease. 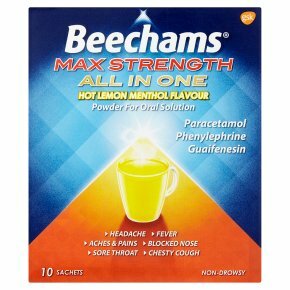 DO NOT TAKE MORE MEDICINE THAN THE LABEL TELLS YOU TO.<br>IF YOU DO NOT GET BETTER, TALK TO YOUR DOCTOR.<br><br>Contains paracetamol.<br>Do not take with anything else containing paracetamol while taking this medicine. Talk to a doctor at once if you take too much of this medicine, even if you feel well.<br><br>KEEP OUT OF THE SIGHT AND REACH OF CHILDREN.